Home > Phastek Sport COUPONS, SALES & SPECIALS! 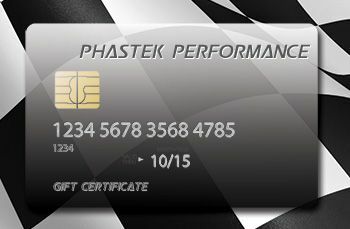 Phastek Sport Coupon Codes, Sales Items, Special Promotions and Discounts! COUPON CODES that you can use when ordering online at Phastek Sport! Use Discount Code "TAX14" on your Shopping Car Page to receive an extra 5% Discount! Save 3% order for Scion FR-S / Subaru BRZ parts and accessories at Phastek Sport! Save $50 Off Borla UEL or Agency Power Header for your Scion FR-S / Subaru BRZ at Phastek Performance! NEW: Special Financing options from PayPal via Bill Me Later! Gift certificates are available for the car enthusiast in your life. This makes a great gift! Phastek has access to thousands of parts from leading manufacturers. Don't see it on our site? Just ask about it! Purchase one here.